Recipes for the people I love. About a month ago my mother in law called me out of the blue and asked, "Do you want a tread-mill?" to which I replied, "ummm, yes?" And within the hour I had a treadmill in my garage just waiting to burn all those unwanted calories off of my ever growing hips. Fast forward a few weeks to when my mother in law was cleaning out her cabinets and stumbled upon a smoothie maker still in the box and never used. She asked me if I wanted it or not, and, after considering what I had planned for dinner that night (NOTHING), I quickly snatched it up and became a hero when I made fruit smoothies and peanut butter sandwiches for dinner. Thus, our love of fresh fruit smoothies was born in my kitchen. There are millions of ways to make smoothies both healthy and un-healthy. So far ours have been relatively healthy. We have been making them by tossing in fruit, ice, and milk or yogurt and blending away. But, now I feel an obligation to create a REALLY healthy smoothie to have after I run walk the calories away on my new treadmill and become a healthier version of me. Thanks to Pinterest it didn't take me long to find a recipe for a healthy smoothie. What I like about this recipe, well all smoothie recipes really, is that I can change it up. I can mix in any combination of fruit that I want and know that I am getting a ton of healthy vitamins in one meal. I'm not so good at eating vegetables, especially those dark green ones that doctors tells us to eat, so the spinach is a great thing for me. I can't really taste it at all, but yet my body is benefiting from all the healthy goodness that spinach offers. 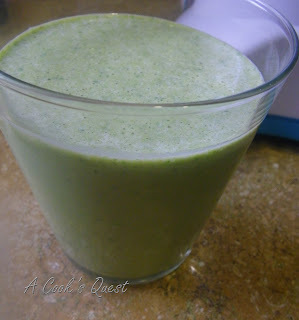 I stayed pretty true to the original recipe substituting only non-fat milk for the Vanilla Almond breeze and using only 2 cups of spinach. 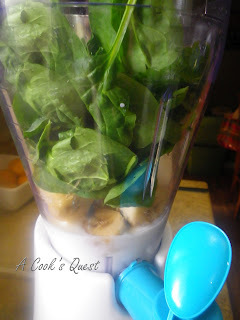 Using less spinach reduced the bright green color of the original recipe, but that is OK, it was YUMMY! My children, as well as three of their friends, tasted it and said it was good, but no one was overly excited about it like I was. Next time I think I may add a scoop of protein powder, omit the peanut butter, and throw in a few strawberries and blueberries. YUM! So go on, mix one up and ENJOY! That is almost exactly the kind of smoothie I make, except I use Fage greek yogurt (love it! ) a tiny spot of honey and frozen blueberries. I also throw in a scoop of whey protein for added umph so I am not so hungry later! Have fun with your new stuff!!! Brandie I can't wait to play around with more combinations. A scoop of protein is going in tomorrow along with strawberries and blueberries...YUM! Hello! My name is Jenn, and this is where I document my adventures of cooking on a budget. I clip coupons, watch sales, and try to make as much food from scratch that I can. I try to keep a balance when it comes to food. Not all the recipes on this blog are healthy, but I believe if everything is done in moderation, with good doses of fresh fruit and veggies, along with food made with minimally processed ingredients, my family can splurge once in a while.